From Myrtle Beach, SC take highway 17 north to Supply, NC. Turn right on highway 211. 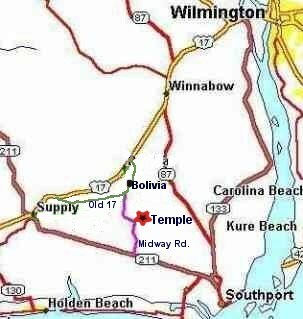 After a few miles, turn left on Midway Road - The temple is on Midway road. From Charlotte, NC take highway 74 East and exit right on highway 211 at Bolton, NC. After aprox 25 miles, Cross highway 17 and continue to Midway road. Turn Left on Midway road. From Wilmington, NC go South on highway 17 to highway 211. Turn left on highway 211 and continue to Midway Road. Turn left on Midway road.